New Study: Alzheimer's disease is dramatically under-reported on death certificates, possibly 500,000 deaths can be attributed to Alzheimer's disease each year. That would make Alzheimer's disease the 3rd leading cause of death, behind heart disease and cancer. Caregiver University: We are nearly 1 month away from our first Caregiver University! You can find more information and register by clicking here! Dancing Through Time is two weeks away!! We can't wait!! You can purchase your tickets or vote for your favorite dancing star by clicking here! Want a sneak peak? Check out WBOY's Kristian Claus and partner Gretchen Moore's practice session during a commercial break! What's New in Research: Mark your calendar for 3/28 in Charleston and Morgantown for our next community workshop, What's New in Research. For more information, contact 800.72.23900. When you travel the country, and even around the world you discover that even though each culture has different names for favorite dishes - there so many common themes. For example, the easy to take to work meal - in the West Virginia coal mines it was the pepperoni roll, in the cotton fields of Mississippi it was the tamale - small, portable, one-handed consumption and delicious. 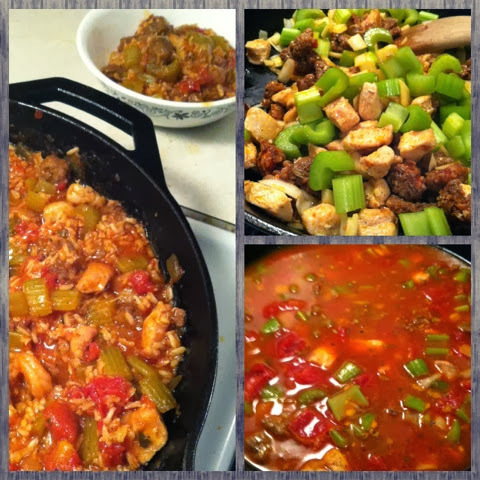 Jambalaya is no different, every culture has a "throw what you have on hand to make and inexpensive meal" dish. Jambalaya happens to be the one I grew up with. It is so easy to make, it will become a week night favorite. This is a list of my favorite ingredients, but you can sub out whatever protein & vegetables you have on hand. This recipe fed four hungry people. Heat a large saucepan to med/high heat. When the pan is hot pour in 1-2 tbs of oil, and add chicken. Allow the chicken to brown, then add sausage to brown. A lot of people take the meat out at this point. But...I think it tastes better if you just make it all in one pot. Add the onion & garlic followed by celery and okra. When the onions begin to turn translucent, add the diced tomatoes - including the juice. Add bay leaves, creole seasoning, salt and pepper, Worcestershire & hot sauce. Cook for an additional 5 minutes. Then add rice and liquid, bring to a simmer. Allow to simmer for 20 minutes or until rice is soft. (Warning, if you use brown rice, it will have to cook FOREVER!) At the very last moment add the shrimp and allow to cook until the shrimp turn pink! Serve with a heaping slice of cornbread.